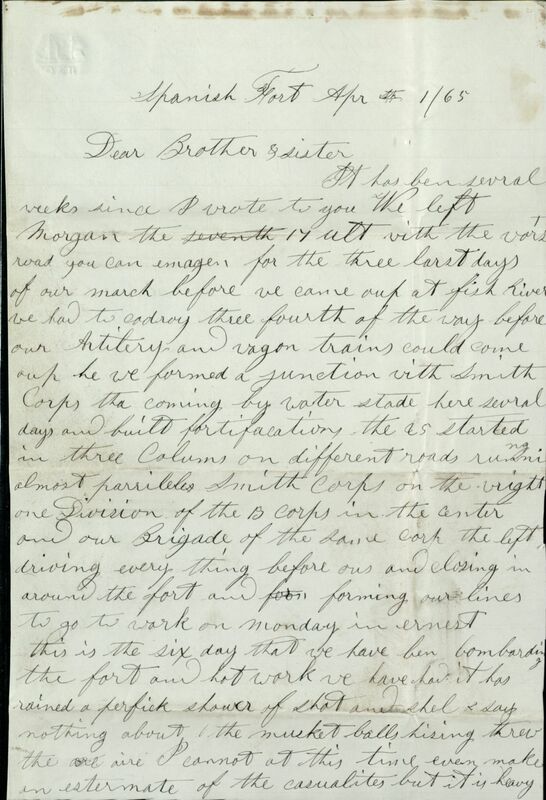 In the final letter of the collection, dated April 1, 1865, Carlton describes the Battle of Spanish Fort, which was one of the last Union assaults of the war. In July 2012, The Texas Collection acquired the letters of Hiram W. Carlton, a Union soldier who spent a significant portion of his enlistment in the South. Hiram W. Carlton was residing in rural Illinois when the Civil War began. Like many of his contemporaries, Carlton sought to serve the country he loved through military service. When the time came, he joined the 94th Illinois Regiment, which would go on to fight in key battles such as Vicksburg (Mississippi), Brownsville (Texas), Mobile Bay (Alabama), and Spanish Fort (Alabama). Readers first encounter Carlton in the town of Brownsville, Texas, where he claimed that the 94th Illinois Regiment was the first to capture the Confederate position. Carlton was not married at the time, so he directed most of his correspondence to his sister Mary and her husband Merrill Walden, who had removed themselves to Portland, Maine, at the outset of the war. His letters ring of homesickness and loneliness but also with an unwavering resolve to do what must be done. Researchers interested in the Civil War will find stories of intrigue, humor, and suffering within the pages of these letters. In the winter of 1863-1864, Carlton accompanied his unit into the Mexican town of Matamoras, where an American consulate requested protection from the fighting that was taking place between the native population and French forces. While most students of history are aware that the Union feared an English or French alliance with the Confederacy, the danger of mounting hostilities between the French/Mexicans and the Union forces that are presented within these letters is breathtaking and suspenseful. The Hiram W. Carlton Letters (1862-1865) also reveal the human side of an ordinary soldier. While spending time in Brownsville, Carlton was court-martialed for disobeying a direct order that he believed lacked any sort of common sense. He ultimately paid for his stubbornness with three months’ hard labor and a loss of two months’ pay, but the way in which he recounted the tale was so casual that it borders on hilarity. 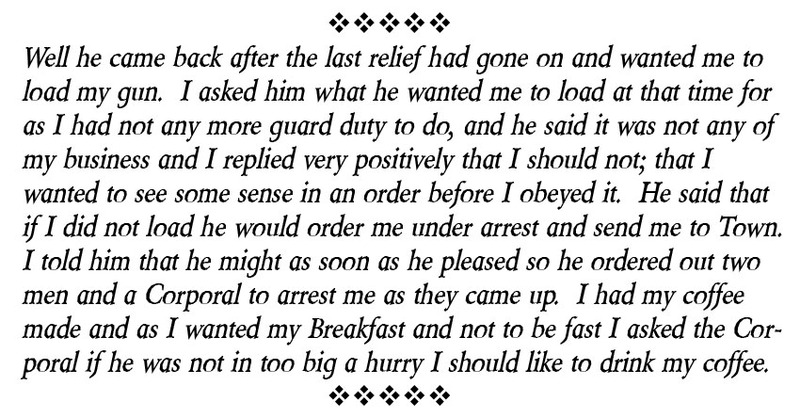 In this letter from May 10, 1864, Carlton recounts to his sister the circumstances surrounding his court-martial. His reaction to his superiors was casual yet defiant, earning him three months of hard labor and two months without pay. Yet in every soldier’s life, there is almost always the pain of loss and suffering. The reader will walk alongside Hiram as he endures bouts with scurvy and other serious ailments. News of significant victories by General Ulysses S. Grant and General William Tecumseh Sherman were tempered with losses of thousands of men. And Hiram experienced personal loss—his brother, Jefferson, died in a Confederate prison near Richmond, Virginia. Recently, The Texas Collection released an online exhibit, “Believe Me Your Own: Letters from the Battlefield to Fanny from Alex, 1862-1865.” This collection of letters chronicled the experiences of Confederate surgeon Alex Morgan and shed some light on the difficulties that soldiers experienced in daily life. Comparing the letters of Alex and Hiram proves the old adage that “there are two sides to every story.” While Unionists and Confederates differed strongly in their views of slavery, economics, governance, and the future of the North American continent, the average soldier was not as different from his counterpart as one might expect. In both Alex’s and Hiram’s letters, we see the struggle of ordinary men to survive and thrive in wartime.